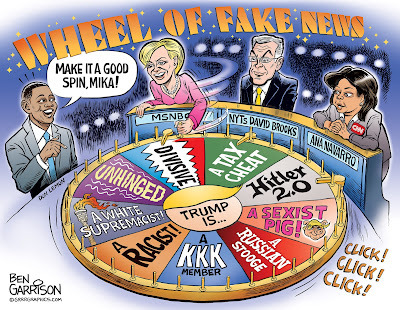 Rogue Cartoonist: "Wheel of Fake News"
Once their historic candidate lost, the media ran with Hillary’s new directive: Claim Trump was in league with the Russians, who ‘hacked’ her election. Smear him as a traitor. Shills such as Bill Maher ran with this lie weekly on his HBO comedy show. They doubled down and then tripled down on the 'Russia' narrative even though they lacked facts to support it. Real facts pointed to leakers such as Seth Rich. The DNC rigged their own primaries and it backfired. Now their ‘Russia' narrative has also backfired. Give the mainstream media an inch and they'll make a crude mile of nonsense out of it. The legacy media’s repeated failure is dangerous, however. If the Deep State’s megaphone isn’t working, they shadow government may resort to more drastic measures in order to remove our president--including war, false flags, a stock market crash, and perhaps even a civil war. The rats want to sink the president’s ship, even if they go down with it.